In 2016, Warwickshire Wildlife Trust purchased Bubbenhall Wood and Bubbenhall Meadow (the meadow between Ryton Pools and Bubbenhall Wood) and following some access improvements, it is now open. You can enjoy the contrast of ancient woodland and new meadow. One of the aims of the trust is to give greater access to the countryside as the reserve is nestled in the heart of the trust's Princethorpe Woodlands Living Landscape project which will link up Wappenbury and Ryton woods with stretches of woods and hedgerows. A vital part of the project is reconnecting local communities with the landscape and its rich heritage. The carpark off Paget's Lane is accessible for Warwickshire Wildlife Members, using the members combination code, however permissive access to the wood, meadow and pathways has been granted to the general public. Parking on Paget's Lane, or in passing places, is not permitted. 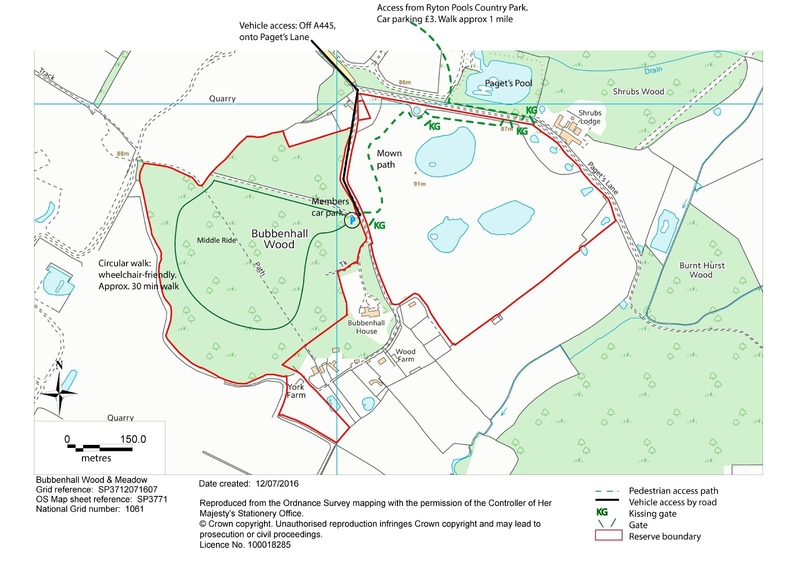 It is recommended that villagers access the wood on foot, either via Ryton Pools and the new path across the meadow, or from the track leading from the A445 (opposite the top of Pit Hill) to Glebe Farm. You are not encouraged to walk along Pagets Lane, as cars can drive dangerously fast along here. From the Bubbenhall Wood, there is a mown path through the meadow up to a kissing gate near Shrub's lodge. From here is it possible to walk to Ryton Wood. Enjoy a circular walk around Bubbenhall Wood, accessible either from the kissing gate on Paget's Lane, or from Middle Ride (the existing public footpath). Please note that dogs are required to be kept on a lead at all times, and kept well away from the pools in the meadow. For a map of the pathways, please see the map at the foot of this page. Warwickshire Wildlife Trust have many FREE events and activities taking place at Bubbenhall Wood and Meadow Nature Reserve, thanks to funding from The Heritage Lottery Fund. These events aim to open up the reserve for the benefit of all and provide opportunity to learn more about this fantastic site and its interesting heritage. Travel to events by foot is encouraged where possible. Due to the interesting history of the site, the trust will be carrying out an oral history project to capture people's memories of the area to ensure that future generations can learn more about this important and interesting reserve. Do you have memories of the reserve or have photos you would like to share? If so, they would love to hear from you. Are you interested in getting involved by becoming an oral history volunteer? No prior experience is required as all training and support will be provided. To get involved, please contact Faye Irvine, Wildlife Engagement Officer.